We are undergoing extensive master bathroom remodel. 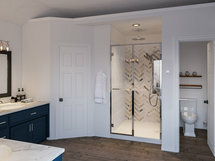 Within the confines of the existing walls and plumbed areas, we want a complete redo - flooring, lighting, remove huge 60x60 tub and replace with walk in shower, remove old (smaller) shower and replace with ??? 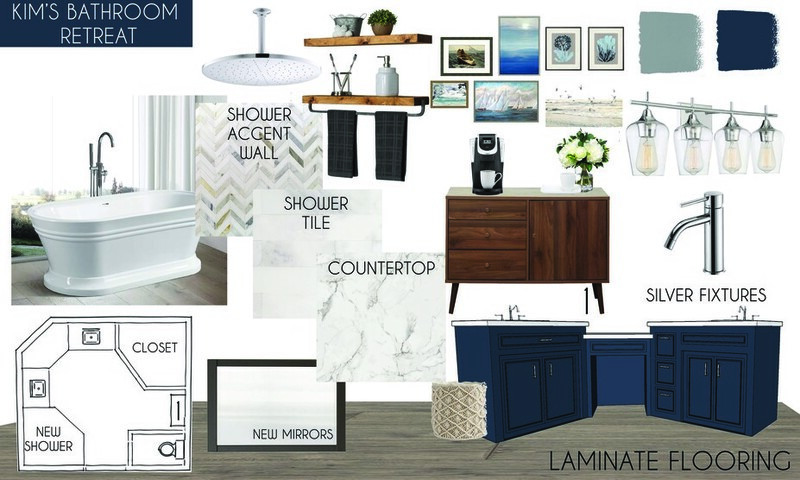 Need help with ideas for what goes where, fixtures, tile choices for flooring and shower, countertops, etc. Can probably use existing cabinets, but need to be updated. 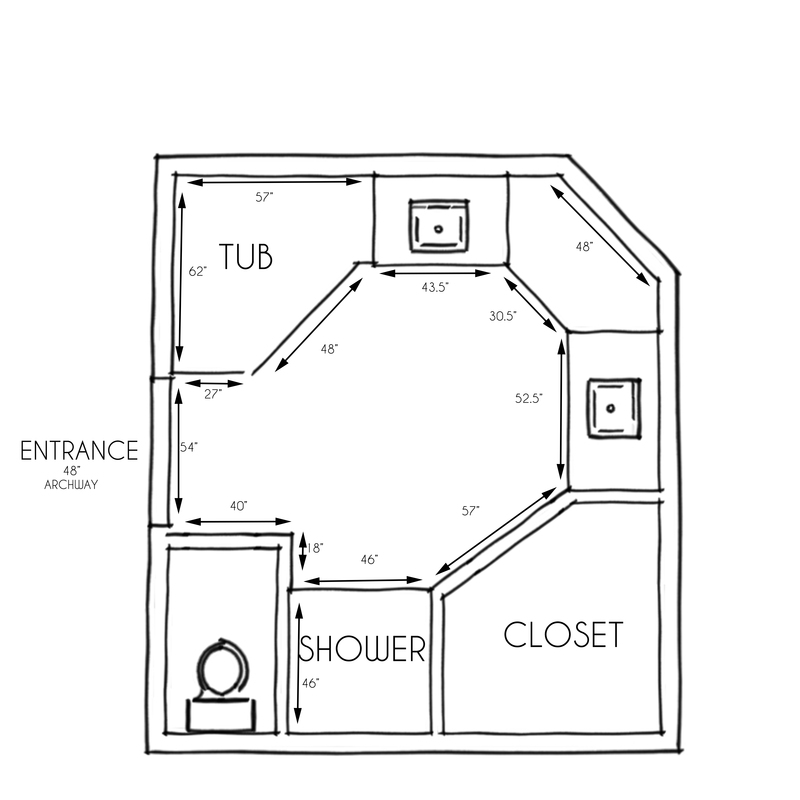 I'd like the bathroom to be spa-like, relaxing, and I'd like for the room to double as a space in which I can do yoga in the mornings (that being said - cold tile floor might not be the best option - I'm open to ideas on this). I would say that my overall budget (including the contractor work) is around $20-$25K. This is the first time I've worked with a designer. We hope to eventually remodel almost every room of the house, so I'm not set on any particular style that we need to match with. I like to incorporate some international style, as we like to travel, and our daughter is from Ethiopia. Also, my brother-in-law does some cool art that we may want to include in various rooms of the house, so that's a consideration overall, but probably not for the bathroom. Just need some guidance to make sure that we're making the right choices for layout, flooring, lighting, fixtures, and other design elements. VERY open to your ideas! Kim would like to remove the tub and potentially replace with a large walk-in shower. She wants something a little more private and not all glass for the shower. She is open to removing or changing the window to work with the shower. 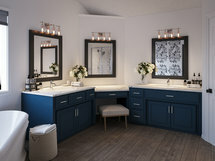 The vanity can be removed or given a face lift. The area where the shower is now is up for creative solutions. She doesn't really need more storage but it open to ideas. She likes to do yoga in the bathroom so for flooring she doesn't want anything too hard like ceramic tile. The shower is perfect now! Cavett Wood Frame Ottoman Frame is benchmade with certified sustainable kiln-dried 100% solid American walnut with a clear lacquer finish Synthetic webbing suspension system Soy-based polyfoam and fiber tight seat Made in North Carolina, USA of domestic and imported materials See product label or call customer service at (800) 967-6696 for additional details on product content Discount link available to project holder only Overall DimensionsWidth: 22"Depth: 19"Height: 15"
Contemporary Round 14" Rainhead with Katalyst Air-Induction Spray Enjoy a shower that simulates the soaking deluge of a warm summer downpour. This contemporary-style showerhead features innovative Katalyst air-induction technology, which efficiently mixes air and water to produce large water droplets and deliver a powerful, thoroughly drenching overhead shower experience. 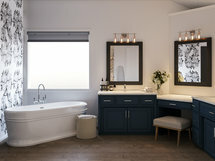 Its clean good looks and durable finish coordinate with many other Kohler® faucets and accessories. Product Details Shower Head Type: Rain Shower Head Flow Rate: 2.5 Country of Origin: China Discount link available to project holder only Height : 2.75" Width : 14" Depth : 14"
Quantity: 2 Not Included: Drain Assembly/ Waste Rough-In Valve Features Number of handles: 1 Drain assembly and rough-in valve sold separately Product Details Installation Type: Single hole faucet Handle Included: Yes Discount link available to project holder only Spout Height	4.5'' Spout Reach	2'' Faucet Centers	2'' Overall Faucet Height	6.5'' Overall Product Weight	4 lb. Talon Calacatta & Thassos Marble Tile This luxurious Calacatta & Thassos polished marble mosaic will provide endless design possibilities, from contemporary to classic, and will serve as a great focal point to suit a variety of settings. The mesh backing not only simplifies installation, it also allows the tiles to be easily separated which adds to their design flexibility. The natural stone material will have a color variation. Bring some sophisticated flair into your home with this chic selection from our Talon Collection. Discount link available to project holder only Chip Size 1" x 4.5" Sheet Size 10 3/4" x 10 3/4"
Freestanding Soaking Bathtub Relax and unwind in this 59" x 24" Freestanding Soaking Bathtub. The white finish completes the contemporary design of this soaking bathtub that would be a great addition to any bathroom. What's Included? Drain Assembly/ Waste Overflow Drain Product Details Material: Fiberglass Faucet Included: No Drain Placement: Center Discount link available to project holder only 59" x 24"
Loft Super White Glass Penny Round Tile Loft Super White Glass Penny Round Tiles Make your back splash the kitchens, bathroom or decorated room focal point by using the striking glass tile. Add some style to your decor! This should give it a more distinct look. These glass tiles will add a durable lasting beauty and value to your bathroom, kitchen, fireplace, or pool installation. The color is painted on the back of the tile so it will not scratch or chip off. You can also use this as a finishing or border of your project. Discount link available to project holder only Chip Size D3/4" Sheet Size 12"x 11 1/2"
Drew 2 Piece Wall Shelf Set Features Shelves can be stained. However, they must be sanded first High grade pine wood Mounts to the wall with drywall anchors or a stud Purposeful Distressing Coat/Paint Distressing (Paint is purposely rubbed or scraped off for a distressed look.) Discount link available to project holder only Overall	3.25'' H x 25.5'' W x 5.5'' D Shelf	24'' W x 5.5'' D Overall Product Weight	8 lb. Cascais White Ornate 9x9 Matte Porcelain Tile About the tile: The White Ornate Tile's statement palette is classic like the city of Cascais itself. This 9x9 encaustic tile captivates the eye with its exquisite design and cement look. Gentle geometric patterns in black and white converge to form a uniform style which will dazzle guests. Durable and easy to maintain, the Cascais White Ornate tile can be used on floors or walls. 20 pieces in a box. Discount link available to project holder only 8.75" x 8.75"
Instinct White 24x24 Porcelain Tile Enjoy the distinct look of stained concrete floors with the added durability of porcelain with Instinct, a bold new series of cement-look porcelain that combines the contemporary look of concrete that has been worn by time with subtle hints of variation. Easily adaptable to any décor this series is suitable for residential or commercial applications and is the perfect choice for your next bar, office or restaurant project. Available in large format 12x24, 24x24 & 32x32 options, as well as 2x2 mosaics. Discount link available to project holder only 24" x 24"